* CRSQ Editor Kevin Anderson on Real Science Radio: Wow! Hear about the latest scientific findings on the human genome, junk DNA, antibiotic resistance, and our genes being read forward and backward, from Dr. Kevin Anderson! If you enjoy celebrating the creative genius of our God, you'll just love hearing the microbiologist editor-in-chief of Creation Research Society Quarterly, a refereed scientific journal, talk in studio with Bob Enyart about the latest in genetics! * Personhood Pro-lifer Gunned Down in Michigan: Jim Poullion, Christian pro-life activist with Flip Benham's Operation Save America and fellow worker and friend of Cal Zastrow, Personhood USA and Michigan Citizens for Life, was murdered this morning by a 33-year old Michigan man angered by anti-abortion signs. Jim was holding a poster-sized photo of a baby boy, Jeremy Trewhella, emblazoned with the single word LIFE in front of the Owosso High School when he was killed by Harlan Drake, whom the police later arrested after Drake had murdered another person. The poster carried by Poullion, ubiquitous at pro-life events, is of the son of pro-life hero and personhood advocate Matt Trewhella, longtime director of Missionaries to the Preborn. * If You're in Denver Tonight: Come on out to hear science expert Kevin Anderson speak on genetics at 7 p.m. on Wadsworth and 21st Street at the Bethlehem Lutheran Church sponsored by Rocky Mountain Creation Fellowship! * For our RSR Friends: You might enjoy Bob's interviews and debates with atheists and evolutionists incuding Michael Shermer, an editor with Scientific American and the Skeptic Society who in in this famous 73-second excerpt on BEL denied that the sun is a light, illustrating that it's tough debating atheists when they're hesitant to admit to even the most obvious common ground. * Post-show Note: Was Canaan cursed because his dad saw his grandfather naked, and was that why Canaan was cursed and became the patriarch of Israel’s enemies, the Canaanites? No, that's a misread of Scripture. See Bob Enyart's article on this question, along with his three scientific predictions from this biblical passage that will help explain the human X and Y chromosome distribution worldwide. Why was Cannan Cursed? * Bob Enyart Headed to Michigan: Bob will attend the memorial for Jim Pullion and then present a Personhood Seminar on Sat., Sept. 19 hosted by TV personality John Mangopoulos. Bob is bringing the blockbuster Focus on the Strategy presentation to Michigan. Come to the Holiday Inn between Detroit and Grand Rapids at Exit 110 on I-96 near Lansing. All pro-lifers are invited and Michigan Citizens for Life members are cordially invited! Please RSVP to 517-332-1609. * Help Colorado RTL Get Signatures: If you live in Colorado, could you help circulate the Personhood Colorado & CRTL 2010 petition? We need your help! If you live in any other state, can you help to advance personhood via the 2010 ballot or in one of three different ways? Today’s Resource: Have you browsed through our Science Department in the KGOV Store? Check out especially Walt Brown’s In the Beginning and Bob’s interviews with this great scientist in Walt Brown Week! You’ll also love Illustra Media’sUnlocking the Mystery of Life (clip) and Dr. Guillermo Gonzalez’ Privileged Planet (clip) although beware: this last science-packed DVD has a weakness in its unsubstantiated and false assumption of an old age for the earth. You can consider our BEL Science Pack; Bob Enyart’s Age of the Earth Debate; Bob's debate about Junk DNA with famous evolutionist Dr. Eugenie Scott; and the superb kids' radio programming, Jonathan Park: The Adventure Begins! And Bob strongly recommends that you subscribe to CMI’s tremendous Creation magazine! SOURCES: DNA is read Forward AND Backward. Really! Isn't God great! 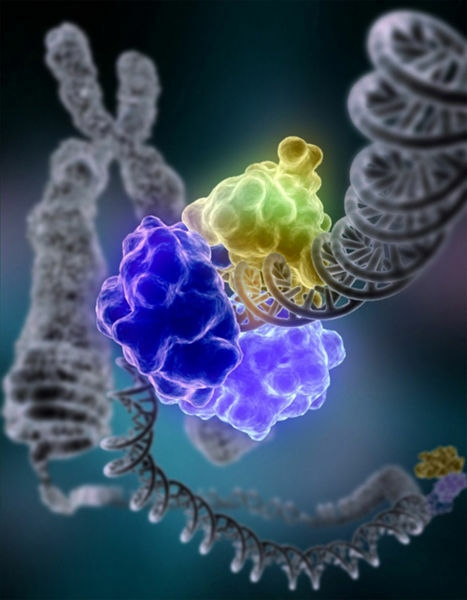 Science Magazine: RNA sequencing reveals divergent initiation, Dept. of Molecular Biology and Genetics, Cornell University. "...antisense [backwards] transcription is prevalent. Additionally, most promoters have an engaged polymerase upstream and in an orientation opposite to the annotated gene. ... These results imply that the interplay between polymerases and regulators over broad promoter regions dictates the orientation and efficiency of productive transcription."